Well after all these 38 years of my life it has become clear to me that you really only do live once. Life is about doing what you love and in some cases doing what you WANT, just because you can. In the spirit of that I have decided to take my 2011 Dodge Challenger SRT8 on a journey of horsepower. For those not familiar with the 2011 Dodge Challenger SRT8, there is a massive problem with the ability to tune these cars. In fact I personally wrote a note to Ralph Gilles months back with no response. The rough Dyno numbers on this after installation is somewhere in the neighborhood of 600 rear wheel horsepower. you will notice this kit gets around the PCM tuning issue by completely replacing the PCM with a brand new pre 2011 model than CAN be tuned. 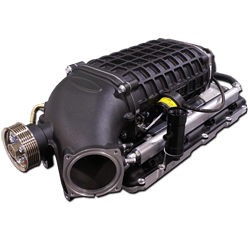 I will also be upgrading the clutch while the engine is pulled to one that supports up to 800 horsepower so the transmission will be more stable. Right now I am working on the transportation down to Virginia sometime in June or July to get the work done. Once I head down to pick it up I will add pictures and some posts about the drive as I come back with it. If you are thinking about this kit hopefully this series of posts helps you decide if it is something you want to do. Good, bad, or indifferent I will let you know how the kit runs. They say the power is completely useable all through the power band so I cannot wait to feel it. UPDATE (6/6/2012): Well, it seems all the parts, and the car, have made it to the shop. Now it’s a waiting game to see if they can get it in any earlier than the week of July 4th. I am hoping that will be the case. In the meantime I just have enough work to keep me busy so I don’t think about it. Sounds exciting, bro! Can’t wait to see the finished product! Any update??? It’s almost the week of the 4th….. The update will come this week when I get to VA to pick her up :). I will get a shop tour with video and pictures to update the post with brother! SHould be sick when it is done.